Applications for graduate study in voice require a pre-screening process, so applications must be submitted by the Priority deadline of December 1. Pre-screening materials must be submitted online using Acceptd. Submit video recordings of three selections from the audition repertory listed below. Following a faculty review, select applicants will be invited to campus for a full live audition. For questions about pre-screening and auditions, please contact Dr. Gregory Broughton, chair of the voice area. ** For the 2019-2020 school year, the MM and DMA degree programs (non-Opera) have openings for all voices. 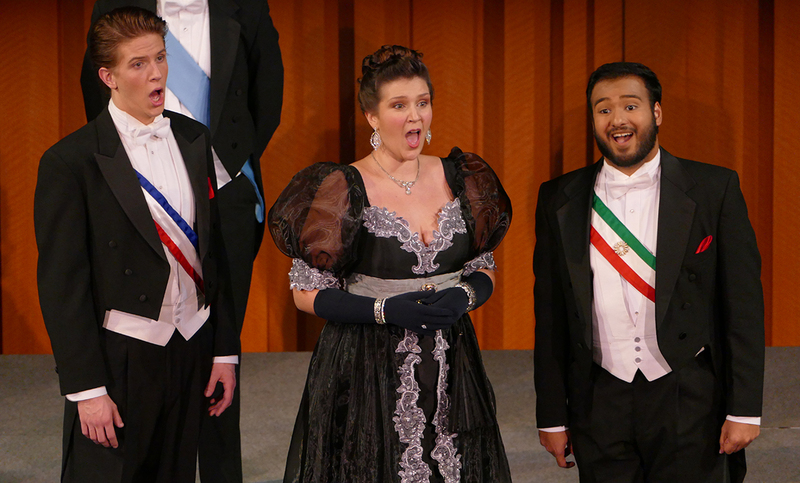 The opera program is currently accepting baritones. Four art songs or three art songs and another aria in the original language. In addition to English, at least two other languages must be representated from Italian, French, and German. Other languages of expertise may be substituted. Arias in English must be selected from an opera or oratorio written in English, not a translation. In addition to English, at least three additional languages must represented from Italian, French, and German. Other languages of expertise may be substituted. Arias in English must be selected from an opera or oratorio written in English, not a translation.